My cousins live in Florida, so I don't get to see them very often. In September 2010, I flew down to visit (you may remember the photograph I shared of the chicken at Popeyes in Oviedo) and met MichelleZ for the first time. As if I weren't impressed enough by her delicious lemon icebox pie - she told me about many other creative outlets she enjoys. Amongst them is paper quilling, where the artist coils and shapes narrow strips of paper into an intricate design. I have been in awe of the detailed little creatures she makes ever since. And am very proud that she officially joined our family last year. Today is her and my cousin Carlo's 1st anniversary! A couple weeks ago she surprised me with her newest creation, a dragon! 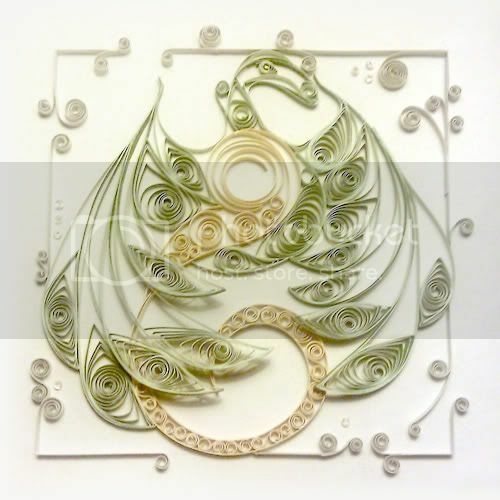 This quilled paper artwork is made with two-tone green strips for the head and wings, solid apricot strips for the body and tail, and solid medium gray strips for the swirly border edge. Techniques include quilling, scrolling, edging, shaping, outlining and even overlaying of wings across body. The detail is astonishing. Does the composition look familiar? She was inspired by my very own August birthstone dragon, "Peridot," originally drawn in ink and colored pencil. I am so incredibly flattered, I'm fluttering off the ground. How awesome! She did a beautiful job! That is phenomenal. Looks like so much work went into it! I gorgeous! Love the layering effect too. Stunning! Both her quilling and your drawing! Love them both! The paper quilting gives it a peacock like look, very cool! Both art pieces are beautiful! Thanks for leaving a comment on my site as I know I'll enjoy following yours. Absolutely wonderful! They both look amazing! Wow this quilled paper artwork inspires me a lot and the feel of dragon gives me such a courage to lead my life in a better way...such a inspiring artwork! !